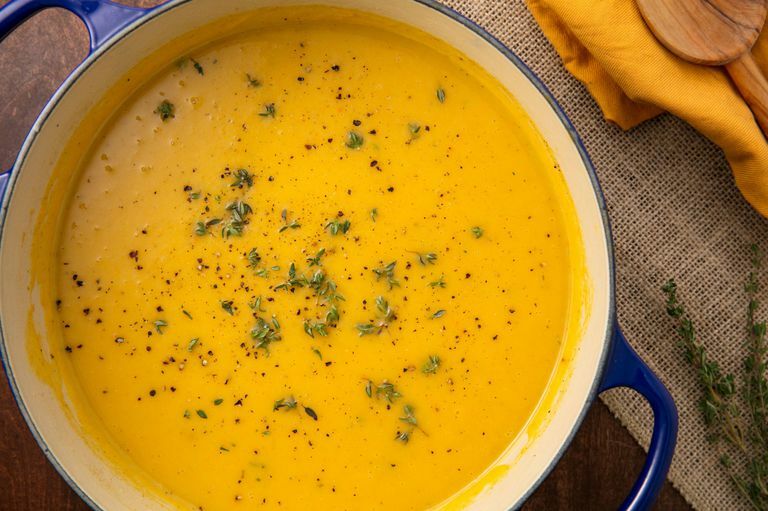 Making soup from butternut squash is one of our go-to moves during the fall. Fortunately for you, it could not be easier. The only downside of cooking with butternut squash is that it takes kinda forever. But once you take a bite of the sweet squash you remember why it's SO worth it. Roasting it before you make the soup is key to getting that caramelized, deeply sweet flavor in the squash that we all love. We love adding a couple potatoes onto the sheet tray with the squash to give the soup an extra creamy texture and more body. But if you'd rather stay away from potatoes, that's totally fine. This soup will work without them! You simply roast the squash with a couple diced potatoes until tender. (You can totally skip the potatoes but we love the starchy creaminess that they give the texture.) While those are roasting, you can start sautéing aromatics: onion, celery, and carrot. Then add your squash and potatoes and chicken broth and use an immersion blender to blend it up! Most good soup recipes start with you sautéing aromatics for flavor. This recipe calls for a classic mirepoix: onion, celery, and carrots that will give it a ton of flavor. We love thyme in this soup because—hello, fall!—but you can use whatever kind you want. Rosemary or sage would be delicious, but even Italian seasoning or dried oregano would work here, too. The conundrum of how to blend up a creamy soup is legit. An immersion blender makes it easiest. The stick blender allows you to just blend up the soup right in the pot! If you don't have one, you can also use a regular blender, just be sure to be careful when blending up the hot liquid (don't burn yourself!). We like to transfer it in batches so it's not so much liquid that the top of your blender flies off (scary, but true). Preheat oven to 400º. On a large baking sheet, toss butternut squash and potatoes with 2 tablespoons olive oil and season generously with salt and pepper. Roast until tender, 25 minutes. Meanwhile, in a large pot over medium heat, melt butter and remaining tablespoon olive oil. Add onion, celery, and carrot and cook until softened, 7 to 10 minutes. Season generously with salt, pepper, and thyme.